Donaghmore Famine Workhouse Museum is a unique place in County Laois which aims to tell the story of the families who lived and died within the famine workhouse walls before, during and after the Great Famine. As a result of the Great Famine era of 1845-1849 about 1,200 people, or 10% of the population of the area, was forced to seek refuge here. 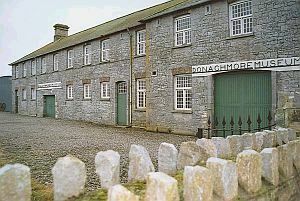 The museum uses guided and self guided tours, combined with various exhibits, to explain the socio-economic conditions which led to the establishment of this and other workhouses.On visiting Donaghmore you will see the authentically restored original dormitories, a kitchen and a waiting hall. All content copyright © Kilkenny Motor Club. All Rights Reserved.